The European Individual Championships were held last week in Graz, Austria. While Millie Tomlinson lived up to her seeding and won the title for the first time, Spanish veteran Borja Golan had to save one match ball before beating George Parker, thus denying England a first ever double. Those of you who follow squash closely are aware that - such as Davis Cup in tennis - the European Individual Championships offer neither world ranking points nor a substantial prize money. 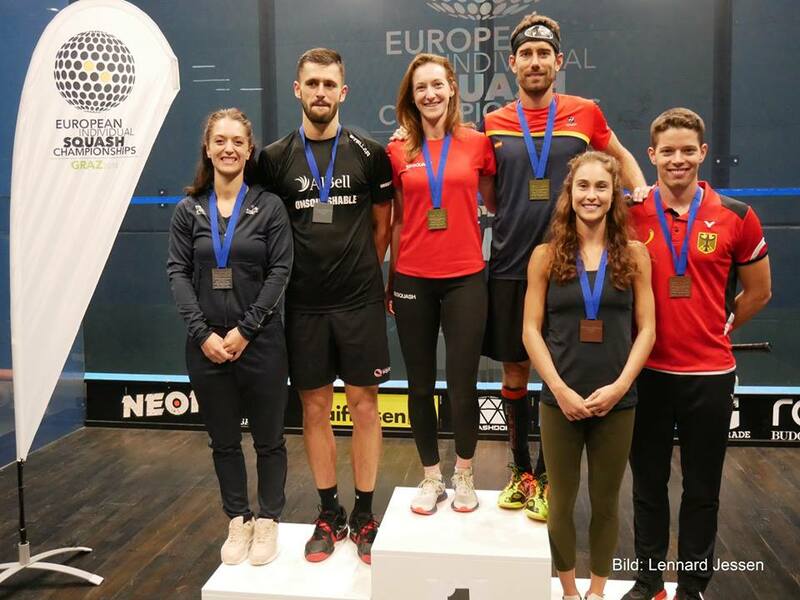 As a consequence, this event has not been attracting the best players lately and numbers don't lie: only 7 out of the 33 Europeans (men and women included) belonging to the world top 50s were attending this year in Graz. For example, France's Grégory Gaultier and Camille Serme had understandably decided to play an exhibition tournament in the US, after having won multiple European titles. 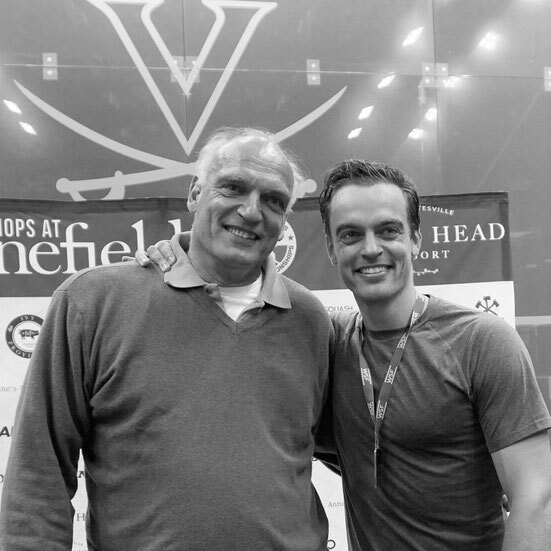 Having said that, England Squash has shown a renewed interested for the event. After James Willstrop winning last year, Millie Tomlinson became the first English lady to put her name on the trophy since former world No.2 Jenny Duncalf in 2010. Comprehensively beaten by Camille Serme in the final in 2017, the Yale graduate was seeded to go one better in Austria - a country where she lost another final, in the European Junior Championship 8 years ago. She had a fairly easy route to the final - not dropping a game in 3 matches - where she was facing another Frenchwoman Coline Aumard, who had upset Belgian Nele Gilis in the semis after a fierce 5-game battle. The result was a repeat of last year's semi-final, where Tomlinson had beaten Aumard in 4 close games: the 26-year-old from Derbyshire handled the key moments a little better (for example in the first game when she came back from 7-9 to win 11-9) to clinch the biggest title of her career. Her low-keyed reaction on the social media ("Proud to win the European Championships this week in Austria") is a reflection of her very calm behaviour on court ... Tomlinson will now try and keep the momentum going in the China Open (see September squash hotspots below), where she'll face Egypt's Salma Hany in the first round on Wednesday. We came very close to the first English ever double in the event, when George Parker found himself with a match ball in the fourth game against 2016 winner and former world No.5 Borja Golan. But the 35-year old Spaniard called upon all his experience to take the game and force a decider - going on to win the match 8-11, 11-4, 10-12, 13-11, 11-6 in 82 minutes. It was the 7th consecutive time that a player in his 30s clinched the title, but Parker - who's had some disciplinary issues in the past - certainly showed some great promise in Austria, the 2015 European Junior Champion coming back twice from 2-1 down: in the quarters against Baptiste Masotti and especially in the semis, where he caused the biggest upset of the week beating German favourite Raphael Kandra after 81 minutes of play. Semi-finalist of the 2018 British Open, Kandra plays with a Victor IP 9RK squash racquet, available on My Squash. Currently ranked 52 in the word, Parker is one of the young players one should keep a close eye on in 2018-2019, starting with the open international de Nantes where he is seeded to clash with Egyptian Zahed Salem in the quarters. 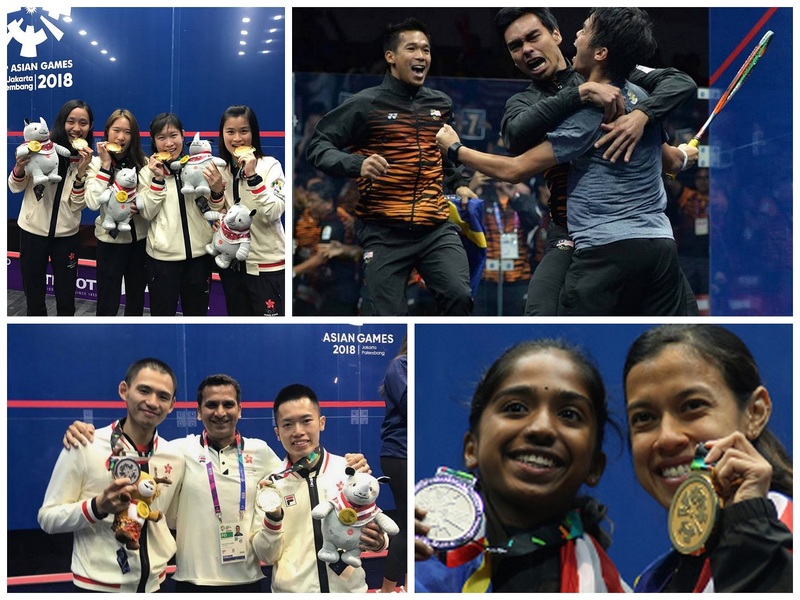 There were plenty of highlights at the 18th Asian Games in Jakarta, Indonesia, where squash was featuring for the sixth time. Nicol David has not been a contender for victory in the World Series events lately, but she is undoubtedly a legend of her sport - she was recently voted as the female GOAT (greatest of all time). Malaysian superstar celebrated her 35th birthday by claiming a record fifth gold medal - 20 years after winning her first. She fought back from 2/1 down to overcome her 19-year old compatriot Sivasangari Subramaniam, who had had two of the biggest scalps of her brief career to reach the final, seeing off second seed Annie Au in the quarter-finals, then world No.16 Joshna Chinappa in the semis. The men's final was also a one-nation affair in which second seed Max Lee, the Hong Kong No.1, faced domestic rival Leo Au, both having come back from 2-1 down in their semi-finals against Saurav Ghosal and Nafiizwan Adnan respectively. It was World No.21 Au who came on top in 4 games, clinching the biggest trophy of his career. These two nations had more success in the team events, but not as we expected: in the women's draw, India caused a massive upset after ousting Malaysia in the semis - Joshna Chinappa beating Nicol David 11-9 in the fifth game - but they could not repeat this performance in the final and prevent Hong Kong to get their first gold medal. In the men's, Hong Kong and Malaysia both reached the men's final unbeaten and were looking for first-time title success. HK's double looked on the cards after Yip Tsz Fung put them ahead but their opponents drew level thanks to Nafiizwan Adnan defeating higher-ranked Max Lee in straight games. The odds were against Malaysia's youngest member Eain Yow Ng facing Leo Au, but the 2016 World Junior Champion certainly played the best match of his career and dispatched the individual gold medalist in straight games. This incredible performance brought the title to Malaysia, after two runner-up finishes in 2010 and 2014. 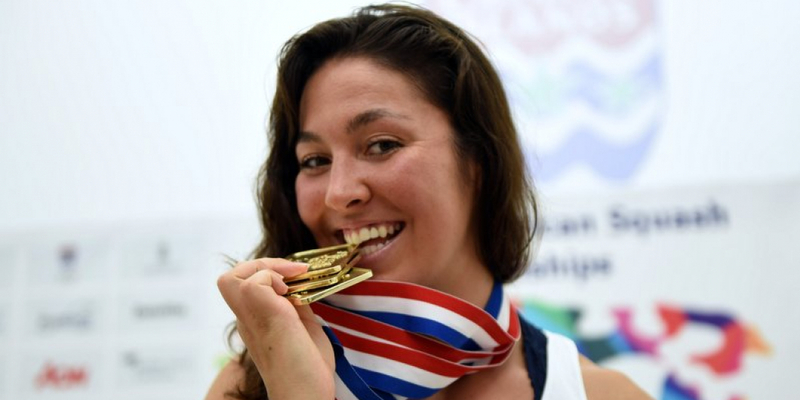 "A highly agressive amount of squash," this is how American Amanda Sobhy described with a smile the Pan American Championship schedule, which were held last week in Cayman Islands. In no more than 7 days, she won the single event beating her younger sister Sabrina in the final, and then the Women's double and team event alongside her. 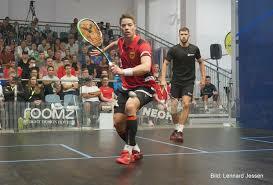 Diego Elias expectedly triumphed in the men's event, which Miguel Angel Rodriguez had decided not to play. The Colombian Canonball still won the mixed doubles with Catalina Pelaez, but he and his teammates lost to Mexico in the Men's team final, Cesar Salazar beating the World No.6 for only the second time in 19 meetings. --- After the summer break, the squash season will start very strongly in September. The main event will be the Women's World Team Championship in the Chinese city of Dalian. With a four-player squad all ranked in the world top six, Egypt are firm favourites to retain their title (see blog of 6th of December 2016). 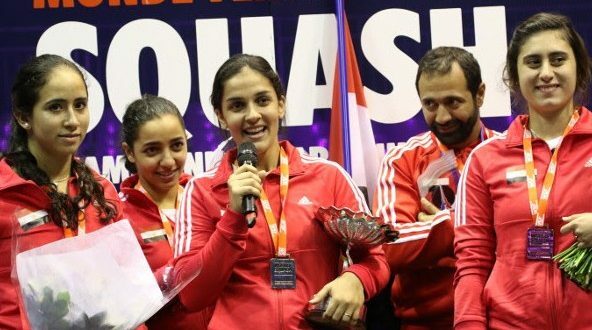 Looking for a fourth title since 2008, they'll be led by world No.1 Nour El Sherbini, a two-time world individual champion, and include world No.2 Raneem El Welily, No.3 Nour El Tayeb and sixth-placed Nouran Gohar. Egypt are expected to face rivals England in the final. Former world No.1 Laura Massaro is supported by world No.8 Sarah-Jane Perry, world No.10 Alison Waters, and Victoria Lust, who boasts a career-high No.13 ranking. USA, featuring the Sobhy sisters Amanda and Sabrina in their squad, are seeded third - ahead of leading Asian nations Malaysia and Hong Kong China, who'll be fighting for top spot in their pool. Initial action will take place in four pools of four teams before the top two progress to the quarter-finals knockout stage. There will also be a lot of action on the PSA World Tour in September, starting tomorrow in Nantes. This time, the organizers are bringing squash to the opera - in the theatre Graslin - for what promises to be once again a stunning show. It could be an England-France battle with former World No.1 James Willstrop and Declan James seeded 1 and 2, while Grégoire Marche will try and remain the only winner and clinch a fourth consecutive trophy in his home country! Meanwhile, all the female top 10 players - including 2017 winner Nour Elsherbini - will be featuring in the China Open, a few days before the WWTC. In the men's draw, none of the Egyptians in the world top 10 including titleholder Ramy Ashour is attending but there are still 7 players among the top 15, including Grégory Gaultier, Simon Rösner, Miguel Angel Rodriguez and Paul Coll. Then it will be Ali Farag, Marwan Elshorbagy, Tarek Momen and Karim Abdel Gawad's turn to start their 2018-2019 campaign in Alexandria, which will host a professional squash tournament for the first time in three years at the Bibliotheca Alexandrina between September 17-21. Finally, World No.1 and defending champion Mohamed Elshorbagy will make his first appearance of the season at the end of the month in San Francisco, where the men's draw includes 8 of the world top 10! The prize money for the women has significantly increased and as a result the draw will also be very strong, with the likes of Raneem El Welily, Joelle King, Camille Serme, Laura Massaro, Nicol David and 2017 winner Sarah-Jane Perry.